Leave the car behind and come walking in Ruby Country. 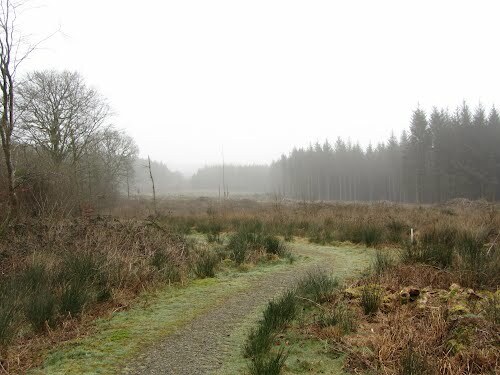 The rural beauty and tranquility of Ruby Country makes it an ideal place to explore on foot. There are many possible routes to follow through breath taking scenery, with ever changing wildlife. As the seasons change, watch the wildlife and landscape respond. Walking in Ruby Country gives you space to think, breathe and be at one with yourself. Walking is healthy too and one of the cheapest leisure activities there is. Ruby Country Partnership is pleased to announce 17 walking trails developed in conjunction with local walking expert, David Arney. These walks are self guided and to get the best from the routes we advise using the appropriate OS Explorer or Landranger maps. Click on the links below to view, download and print the walking routes. 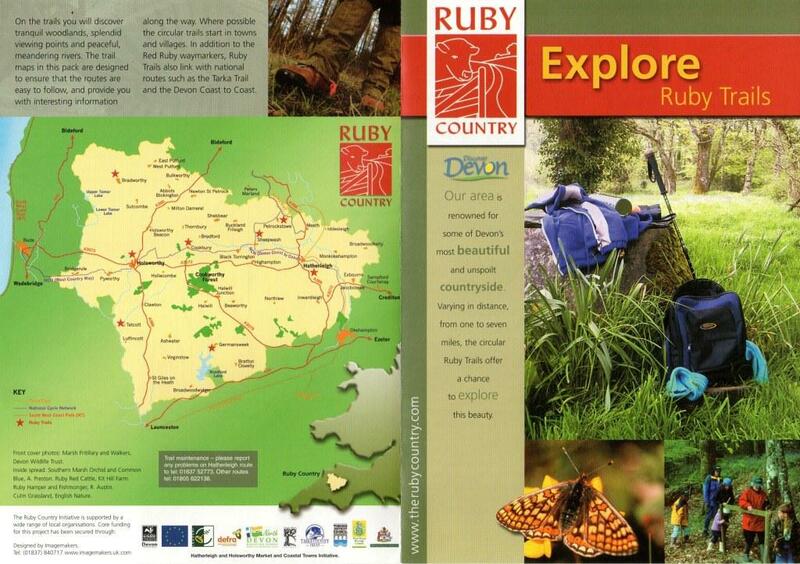 If you are planning your own routes Ruby Country is covered by OS Explorer maps 111, 112, 112 and 126. 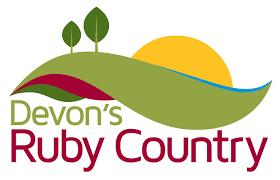 It is easy to link a visit to Ruby Country from the Tarka Trail and it will soon be possible to walk through Ruby Country into Cornwall along the Ruby Way, and from Cookworthy Forest to Dartmoor National Park along the Pegasus Way. There are many places to stay and use as a base for a walking holiday in Ruby Country. You may wish to create your own trail, in which case our list of accommodation providers will help you plan your itinery. 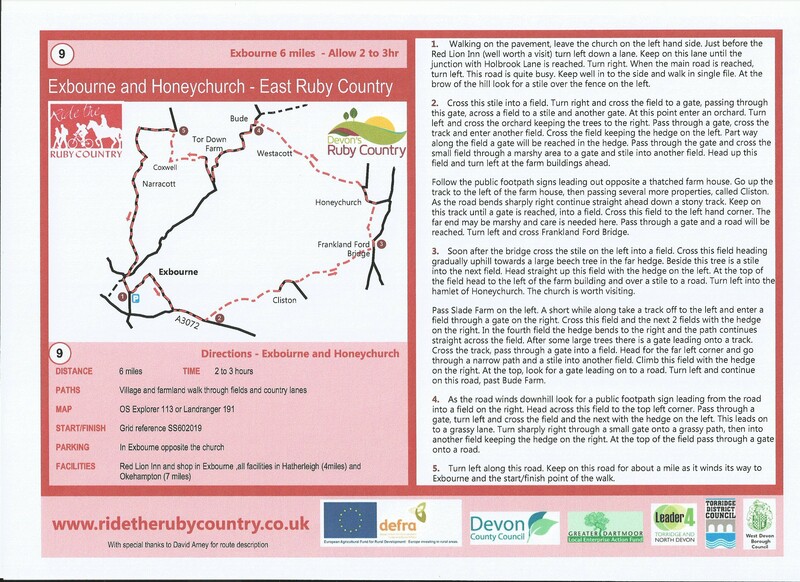 The 8 Ruby Walking Trails are also available to download. The trails follow way-marked routes starting from Holsworthy, Hatherleigh, Bradworthy, Cookbury, Sheepwash, Petrockstowe, Tetcott and Germansweek. You can purchase a pack for £2 from Holsworthy Information Centre. Click on the links below to view, download and print the Ruby Trail Routes. With over 730 acres of water, Roadford Lake managed by the South West Lakes Trust is a spectacular lake in Ruby Country set on the edge of Dartmoor between Okehampton and Launceston. On the southern bank is the Lakeside cafe and Function Suite which includes a Visitor Centre. The Lakeside cafe and gift shop and Visitor Centre are open daily. Another lake managed by South West Lakes Trust. 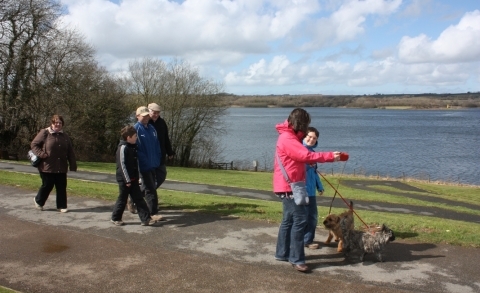 Tamar Lakes is located in the north west of Ruby Country on the border with Cornwall and offers something for everyone, from water sports to birdwatching. 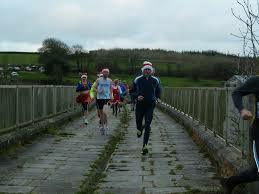 Tamar Lakes parkrun is a FREE weekly 5km event for runners of all standards, which takes place every Saturday at 9:00am in Upper Tamar Lakes, Kilkhampton, Bude, EX23 9SB It is not a race against other runners, but a 5k timed run and it can really be whatever you want it to be, whether that’s for fun or as part of a training plan. 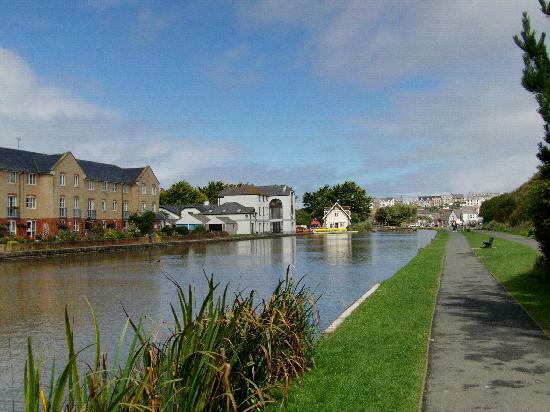 The Bude Canal comprised a mini-network of waterways on the Devon/Cornwall border. It is of considerable historic interest, featuring some of the most unusual and ingenious engineering of the canal-building era. 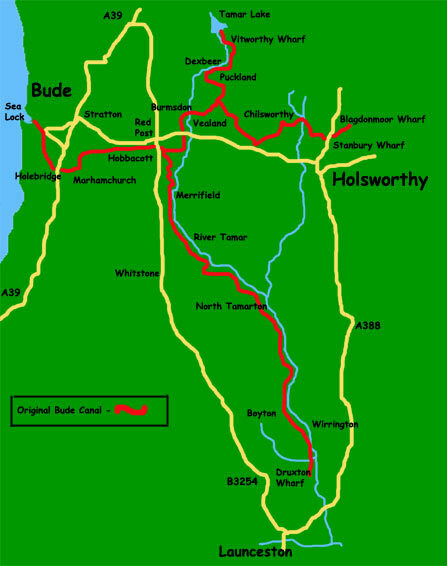 The Aqueduct branch of the system, which is the length in the ownership of the Bude Canal Trust, was the original feeder arm for the whole system, although it was later also used as part of the general canal network. The Bude Canal Trust is a charity whose aims are to retain the historic interest while managing what has become an important wildlife area. The 5-mile footpath along the old towpath gives an opportunity for all to enjoy this wonderful facility. 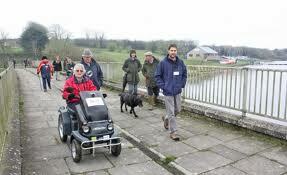 Click here to view and download Bude Canal Trails leaflet produced by Devon County Council. Owned by the Forestry Commission Cookworthy Forest is an impressive conifer plantation in the gentle hills of West Devon, between Okehampton and Bude. A walk in Cookworthy Forest will bring you in close contact with a wide variety of wildlife including ravens, buzzards and red deer. 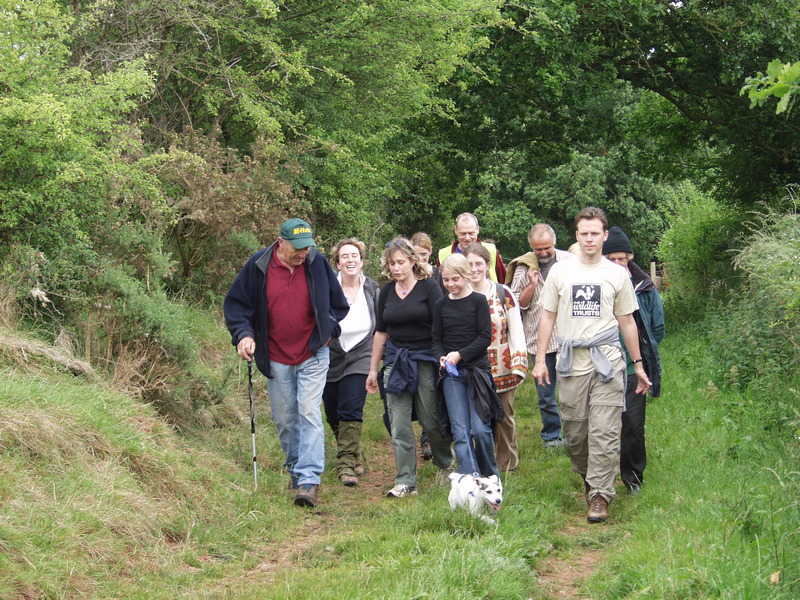 Devon County Council provide information on other options for walks and walking holidays in the area on their website. 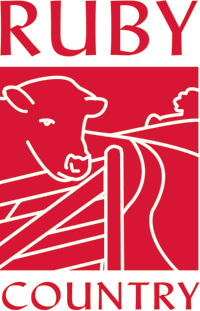 To download a copy of Devon County Councils publication Devon Walking click here (pdf download). There are a selection of walking routes in the nearby North Devon Area of Outstanding Natural Beauty. Visit the website to view more information.